There is a lot of discussion in the forums about Power Mushrooms from Health Concerns as a valuable all natural immune boosting supplement for dogs with cancer. The primary ingredient in Power Mushrooms is the Ganoderma (Reishi) Herbal Formula that combines four of the most commonly used mushrooms in Chinese herbal medicine. Two of these, Ganoderma and Tremella, help strengthen and stabilize the organ systems of your pet’s body. The other two, Poria and Polyporus, assist the digestion and assimilation of the other mushrooms. The effect of this herbal combination is overall energy stabilization and resistance to stress and illness. 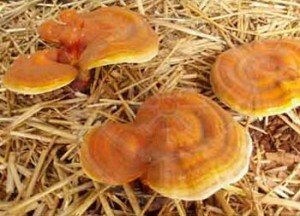 The all natural Power Mushrooms supplement is ideal for immune system support, cancer care, and geriatric animals. Health Concerns says their Power Mushrooms blend enhances immune system functionality. According to Chinese and Japanese research it contains herbs that may have anti-tumor effects. Power Mushrooms boosts energy and is useful for autoimmune disorders. This supplements can be used as an adjunct to chemo and radiotherapy. Please consult your veterinarian when considering any changes to your dog’s treatment plan. 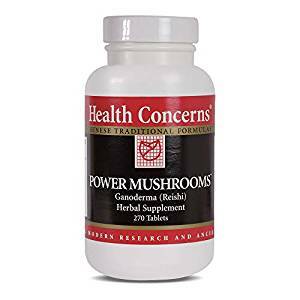 Save on Power Mushrooms Supplement at Amazon! Do you have experience using Power Mushrooms for your pup? Reply with your feedback or write a review for the Tripawds Nutrition Blog! We suggest you discuss this with your vet for a professional opinion. We did, however, just post our video interview with Veterinary Cancer Group founder Dr. Mona Rosenberg. (Not yet in a blog post, see VCG interview in Jerry’s Tripawd Health video playlist.) In Part Two, Dr. Rosenberg discusses the use of “immune boosting” supplements during chemotherapy and why some studies indicat that is not advised. when I click on this link to the video playlist, I get an error message. D’oh! There was a typo in that link. It is now fixed. FYI: The Tripawd Health Videos playlist (and many other movies) is on the Videos page of Jerry’s main blog, not here in the Tripawds Nutrition blog. Sorry for the inconvenience. Thanks for pointing out the error. This may have been answered elsewhere, but does anyone know if you can give the power mushrooms with food? Ruby is not a discriminating eater, and has been eating them with her food. From this forum discussion about power mushrooms it certainly sounds like giving them with food works just fine. Thanks for asking! Does anyone know what medium these mushrooms are grown on? I have pets with allergies so I want to know if this is grown on something that might cause a reaction. Hope this helps. In the Tripawds Downloads blog, Aloha Medicinals provides more information about their mushroom cultivation process for K9 Immunity.